Wacker Neuson high quality concrete products consist of the the CT 48 trowel range utilising a monster 1220mm trowel in diameter to get the job done faster, ideal for finishing medium to large areas. Balanced to perfection the trowel can be easily operated at a variety of different speeds as to what suits the user. Safety is also a huge priority on Wacker Neuson products equipped with a transmission brake, electronic safety switch and an engine speed sensor. And in the case of a emergency the device with the trowel will shut itself off and stop spinning within no more than a three-quarter turn. 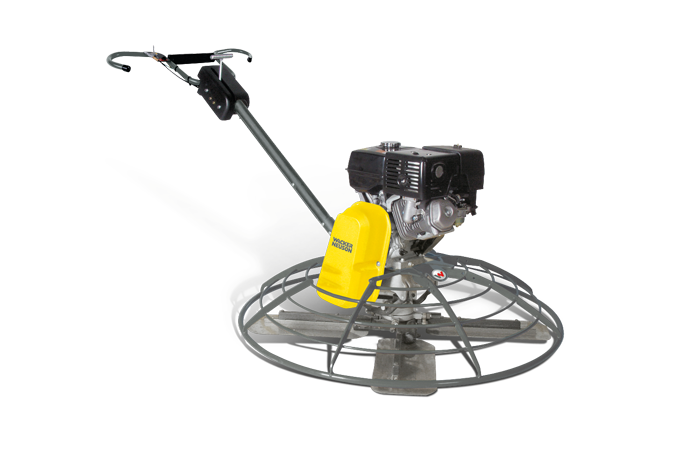 Powered by either a Honda GX240 or GX390 the Wacker Neuson trowel draws on decades of Honda 4-stroke technology in order to power the trowel. 4-Stroke also means no fuel mixing! Eliminating the issue of someone destroying the machine by straight fuelling it. With a blade pitch of up to 30-degrees Wacker Neuson trowels will easily do the job you require. For more information call us on 5331 1618.